TAKE OUT: FEBRUARY 2017 ~ #WOW! 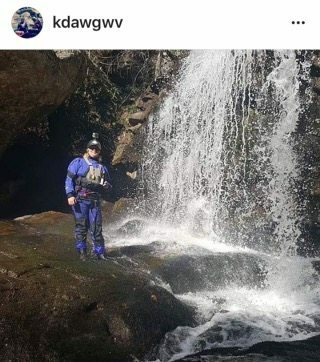 Women of Whitewater Photos from Our Admins around the World | DBP MAGAZINE ONLINE The World's Best Free Whitewater Publication. EDITOR’S DESK: All month long we’ve delivered stories of some awesome Women of Whitewater in these pages and on our various social media platforms- Facebook, Instagram, Twitter, and Snapchat. We thought we’d end the month with a quick profile of 12 more rad ladies selected from our 200 Admins around the world who represent Dirt Bag Paddlers! All photos (nearly) are from their Instagram accounts; we highly suggest you follow them too. #WOW! 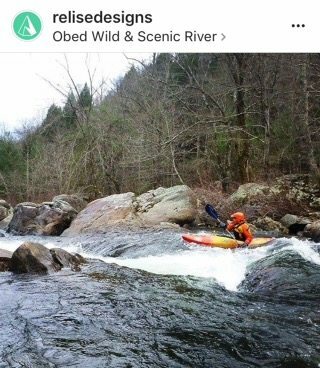 We fire things up with Kelly Gladen of West By God Virginia, who made the journey south to score her personal first descent of the Cheoah River yesterday! Class V at its finest! 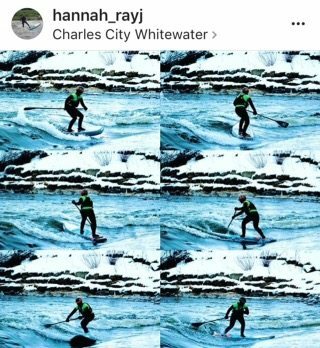 Hannah Ray J was also on the water yesterday in Charles City, Iowa (yes IOWA!!) braving cold temps at the local whitewater park to catch rays and surf all day long on a beautiful sunny day for February. Spin to win! 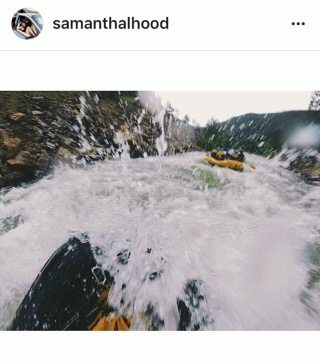 Sam Hood plots her return to work on the rivers of West By God alongside Kelly, but she’ll always have the whitewater of Colorado in her heart. As we like to say around here, you’ve gotta earn that view! Sam certainly has. Same with Amy Van Eerden! Here’s a throwback picture of her on an epic Spring run in the Rocky Mountain State. 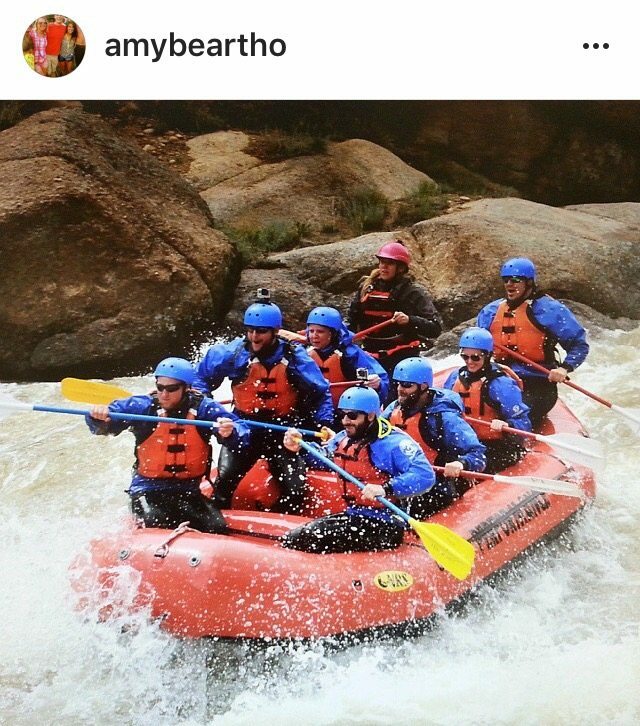 Amy’s on the other side of the world these days, living in and loving the rapids of New Zealand, and pursuing her dreams! 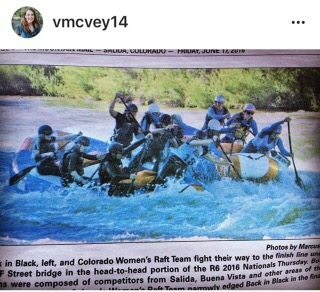 Valerie McVey also hails from Colorado, where she and her teammates successfully compete on one of America’s best female raft racing teams, Back in Black. They look for big things to come in 2017, and we will be right there cheering them on! In Norway, Kaja Zinja Halvorsen loves to kayak, raft guide, snowboard, and rock climb. 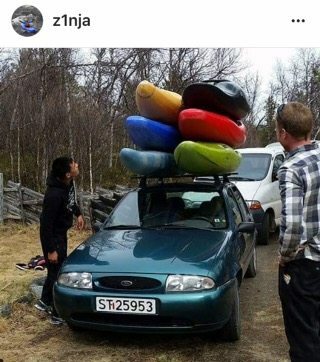 Although February usually finds her slopeside or at the climbing gym, she’s always ready to test her skills at boat stacking on her Dirtbagmobile! There’s room for one more up top! 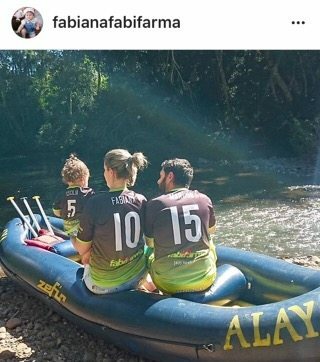 In Brasil, Fabiana Cordiero fully embraces the twin loves of her life, her young family and raft guiding, where she met her husband Marcos. Together they raise yet another river lover in their daughter Cecelia and pass on the #OneLoveOneRiver Philosophy to the next generation! In Maine, Beth MacKenney also balances those same passions. 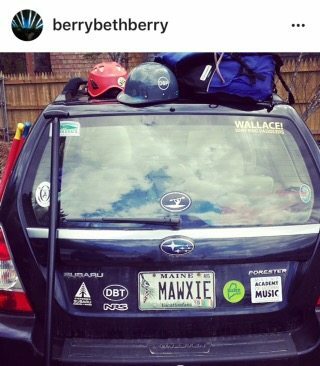 She and her husband also met as young rubber pushers many years ago at Moxie Rafting, hence the license plate. We offer up love and good vibes as always to the MacKenney clan as her son Conner, who was raised to love the river, continues to battle back against evil cancer. #ConnerStrong! In the UK, Storme Sparkes continues to follow her passion and enjoy the pleasures of whitewater in her own unique way. 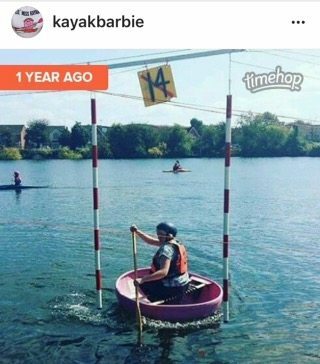 That pink coracle is definitely eye catching! Not something one sees every day, but Storme pulls it off in true #WOW! fashion!! 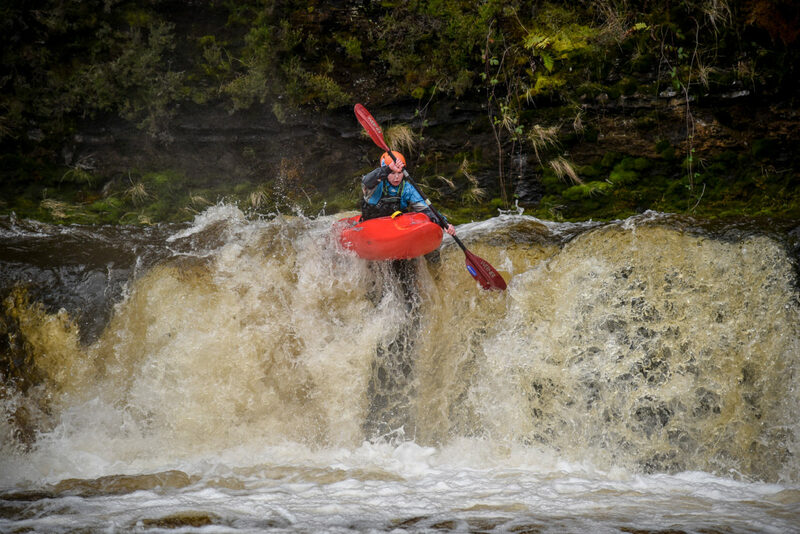 In Tennessee, Rachel Elise pushes her kayaking in the same way she pushes her art and her athletic endeavors at the top collegiate level before that- with gusto! She is the embodiment of a powerful female athlete who sees no barrier that she can’t overcome. Cheers! Also in the UK Adele Read took advantage of the recent stormy weather to get out on the Middle Tawe, enjoying a welcome break from being a teacher! 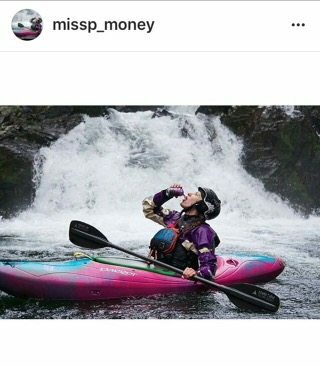 And last but not least, in Oregon birthday girl Priscilla Macy is enjoying the wet season and all it delivers in one of the most beautiful whitewater regions of the world, the PNW. We join her in raising one to toast ALL the wonderful Women of Whitewater who make our sport so fascinating and give our community a wholeness and depth that is truly deserving of celebration! Happy Birthday P Money! To all of the ladies out there reading this, young and old, who are considering giving paddling a try, whether it’s whitewater or flat, we hope these images and the stories we’ve shared inspire and encourage YOU to join us out here! You are always welcome to come boating with the Dirt Bag Paddlers! Like the article? Help us out! We want to keep bringing you the best paddling features and news. TEARING DOWN WALLS ~ Iran’s Woman of Whitewater Hanieh Goharipour.